CAIRO (AP) — Hundreds of thousands of opponents of Egypt's Islamist president poured onto the streets in Cairo and across much of the nation Sunday, launching an all-out push to force Mohammed Morsi from office on the one-year anniversary of his inauguration. Fears of violence were high, with Morsi's Islamist supporters vowing to defend him. 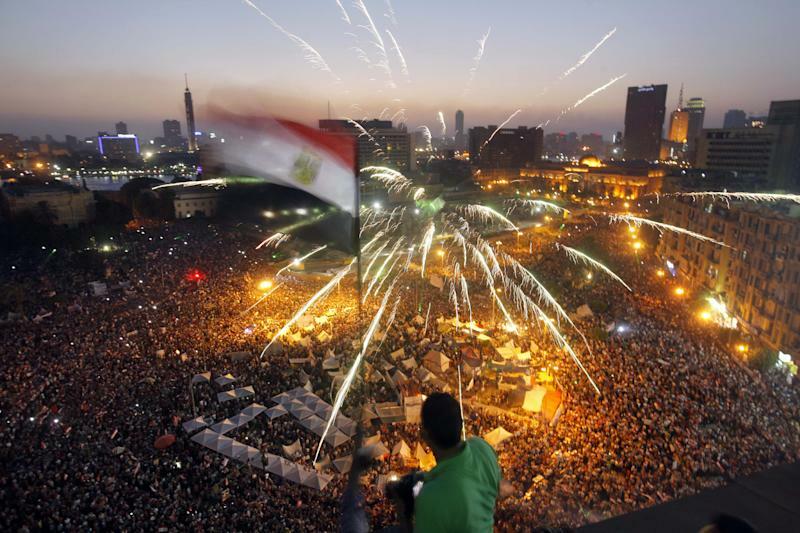 Nationwide, the rallies were among the most gigantic Egypt has seen in nearly 2 ½ years of continuous upheaval, including during the square-packing, 18-day uprising that toppled autocrat Hosni Mubarak in early 2011. Waving Egyptian flags and carrying posters of Morsi crossed out in red, crowds packed central Cairo's Tahrir square, the birthplace of anti-Mubarak, thunderous chants of "erhal! ", or "leave!" rang out. At the same time, a tidal wave of crowds marched on the Ittihadiya presidential palace, filling a broad boulevard for blocks and spilling over into nearby avenues. "You lied to us in the name of religion," some chanted, and others raised a banner proclaiming, "Morsi=Mubarak. Early presidential elections." The crowds hoisted long banners in the colors of the Egyptian flag and raised red cards — a sign of expulsion in soccer. Near Ittihadiya palace, thousands of Islamists gathered in a show of support for Morsi outside the Rabia al-Adawiya Mosque. Some Morsi backers wore homemade body armor and construction helmets and carried shields and clubs — precautions, they said, against possible violence. Their crowd also swelled as sun went down and summer temperatures became more tolerable. Up until nightfall, violence was limited to a few pockets in the provinces as the two sides largely stayed apart. The anti-Morsi protests had a festive, celebratory atmosphere, with many families with young children among the crowds of men, women and elderly. In a potentially volatile confrontation after nightfall, however, several dozen youths attacked the headquarters of Morsi's Muslim Brotherhood on a plateau overlooking the capital. They threw stones and firebombs at the building, and people inside the walled villa fired at the attackers with birdshot, according to an Associated Press Television News cameraman at the scene. Earlier in the day, two offices belonging to the Brotherhood's Freedom and Justice party, were attacked and ransacked in the city of Bani Suef, south of Cairo. The opposition's goal is to show through sheer numbers in the street that so much of the country has turned against Morsi, the country's first freely elected president, that he can no longer rule. Similarly sized crowds turned out in the Mediterranean city of Alexandria and the Nile Delta cities of Mansoura, Tanta and Damanhour, with sizeable rallies in cities nationwide. "Mubarak took only 18 days although he had behind him the security, intelligence and a large sector of Egyptians. Morsi got all of us against him, even the army and police," said Amr Tawfeeq, an oil company employee marching toward Ittihadiya with a Christian friend. "He won't take long. We want him out and we are ready to pay the price." Morsi, who has three years left in his term, has said he will not step down, saying street protests cannot be used to overturn the results of a free election. "There is no room for any talk against this constitutional legitimacy," he told Britain's The Guardian newspaper in an interview published Sunday, rejecting early elections. If an elected president is forced out, "well, there will (be) people or opponents opposing the new president too, and a week or a month later, they will ask him to step down," he said. As the crowds massed, Morsi's spokesman repeated the president's longstanding offer of dialogue with the opposition to resolve the nation's political crisis, calling it "the only framework through which we can reach understandings." "I cannot imagine any substitute for dialogue," said the spokesman Ihab Fahmi. The opposition has repeatedly turned down his offers for dialogue, arguing that they were for show. There is a sense among opponents and supporters of Morsi that Sunday is a make-or-break day, hiking worries that the two camps will come to blows, even as each side insists it won't start violence. Already at least seven people, including an American, have been killed in clashes the past week, mainly in Nile Delta cities and the coastal city of Alexandria. The confrontation is the culmination of polarization and instability that have been building since Morsi's June 30, 2012 inauguration as Egypt's first freely elected leader. The past year has seen multiple political crises, bouts of bloody clashes and a steadily worsening economy, with power outages, fuel shortages, rising prices and persistent lawlessness and crime. In one camp are the president and his Islamist allies, including the Muslim Brotherhood and more hard-line groups. Morsi supporters accuse Mubarak loyalists of being behind the protests, aiming to overturn last year's election results, just as they argue that remnants of the old regime have sabotaged Morsi's attempts to deal with the nation's woes and bring reforms. Hard-liners among them have also given the confrontation a sharply religious tone, denouncing Morsi's opponents as "enemies of God" and infidels. On the other side is an array of secular and liberal Egyptians, moderate Muslims, Christians — and what the opposition says is a broad sector of the general public that has turned against the Islamists. They say the Islamists have negated their election mandate by trying to monopolize power, infusing government with their supporters, forcing through a constitution they largely wrote and giving religious extremists a free hand, all while failing to manage the country. With protesters from a range of social and economic levels in a festive atmosphere, the crowds resembled those from the 18 days of protests against Mubarak — a resemblance the protesters sought to reinforce, chanting the slogan from that time: "The people want to topple the regime." In Cairo, some marchers carried tents, planning to camp in Tahrir or outside the palace. Residents of nearby buildings sprinkled water down on the marchers to cool them in the punishing summer heat and waved flags and blew whistles in support. "The country is only going backward (under Morsi). He's embarrassing us and making people hate Islam," said Donia Rashad, a 24-year-old unemployed woman who wears the conservative Islamic headscarf. "We need someone who can feel the people and is agreeable to the majority," added Rashad, who wore a tiny tiara in the letters of "erhal." "Today is the Brotherhood's last day in power," said Suliman Mohammed, a manager of a seafood company who was protesting at Tahrir, where crowds appeared to approach 300,000 after nightfall. "I came here today because Morsi did not accomplish any of the (2011) revolution's goals. I don't need anything for myself, but the needs of the poor were not met." At the pro-Morsi rally at the Rabia al-Adawiya Mosque, the crowd chanted, "God is great," and some held up copies of Islam's holy book, the Quran. "The people hold the legitimacy and we support Dr. Mohamed Morsi," Ahmed Ramadan, one of those at the rally said. "We would like to tell him not to be affected by the opponents' protests and not to give up his rights we are here to support and protect him." Underlining the potential for deadly violence, a flurry of police reports on Sunday spoke of the seizure of firearms, explosives and even artillery shells in various locations of the country, including Alexandria and the outskirts of Cairo. Banks closed early and most government offices shut down on Sunday, a work day in Egypt. The opposition protests emerge from a petition campaign by a youth activist group known as Tamarod, Arabic for "Rebel." For several months, the group has been collecting signatures on a call for Morsi to step down. On Saturday the group announced it had more than 22 million signatures — proof, it claims, that a broad sector of the public no longer wants Morsi in office. It was not possible to verify the claim. If true, it would be nearly twice the around 13 million people who voted for Morsi in last year's presidential run-off election, which he won with around 52 percent of the vote. Tamarod organizers said they discarded about 100,000 signed forms because they were duplicates. Morsi's supporters have questioned the authenticity and validity of the signatures, but have produced no evidence of fraud. Adding to his troubles, eight lawmakers from the country's interim legislature announced their resignation Saturday to protest Morsi's policies. The 270-seat chamber was elected early last year by less than 10 percent of Egypt's eligible voters, and is dominated by Islamists. A legal adviser to Morsi also announced his resignation late Saturday in protest of what he said was Morsi's insult of judges in his latest speech on Wednesday. A week ago, with the public sense of worry growing over the upcoming confrontation, Defense Minister Gen. Abdel-Fattah el-Sissi last week gave the president and his opponents a week to reach a compromise. He warned that the military would intervene to prevent the nation from entering a "dark tunnel." Army troops backed by armored vehicles were deployed Sunday in some of Cairo's suburbs, with soldiers, some in combat gear, stood at traffic lights and major intersections. Army helicopters flew over Cairo on several occasions on Sunday, adding to the day's sense of foreboding. The aircraft were loudly cheered every time they flew over Tahrir. Morsi had called for national reconciliation talks in a Wednesday speech but offered no specifics. Opposition leaders dismissed the call as cosmetics. Asked by The Guardian whether he was confident that the army would not intervene if the country becomes ungovernable, Morsi replied, "Very." The Egyptian leader, however, said he did not know in advance of el-Sissi's comments last week. AP reporters Tony G. Gabriel and Mariam Rizk contributed to this report.